I help tens of physical therapists each month conquer their student loans. It’s literally life changing for many of mentor sessions and in this article, I really want to teach PT’s how I have grown my multi six-figure finances and how you can conquer $100,000 to $200,000 of student loans in just 2-4 years! Step 1: Understanding money. 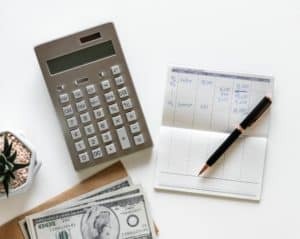 Why conquering your debt is all about maximizing your income. Step 2: Understanding the importance of career choice. Why you MUST choose a high paying career option. Step 4: Maximizing your savings. Why you need to focus on reducing your big ticket fixed cost items like housing. Step 5: Refinance your loans. Why you need to stop wasting thousands of dollars on high loan interest rates. Step 6: Earn easy extra cash. Give yourself some wiggle room by doing these simple steps to earn an extra $150 or more in just several steps! Step 1: Why conquering your debt is all about maximizing your income! Many physical therapists earn an average of $60,000- $70,000 within their first years of graduating. In a previous article, I illustrated how not creating a plan for your loans could cost you thousands of extra dollars and also why it’s so important to get a high paying career even as a new graduate. In that post, I performed a detailed break down of how earning $70,000 after taxes, student loans, and living expenses essentially leaves you broke! Now lets break down what $70,000 is approximately after taxes for a single individual. It is $53,000 according to taxformcalculator.com. If you subtract the $53,000 you earned from being a physical therapist after taxes with your $48,000 cost of living, that leaves you with a yearly savings of only $5,000. That’s a savings of only $5000 at the end of the year. You didn’t even contribute to your IRA or 401k retirement funds, nor do any vacations or trips! So that means that if you tried to pay off your loans in 10 years simply earning $70,000, that you could do this but it would leave you with no retirement, no savings, and no money to live your life! This is why you cannot be satisfied with only making $70,000. You need to really aim for, in my opinion, $100,000 or more in annual salary. I think you’ve now seen that you really need to make more than $70,000 a year to really attack your debt. Let’s look at how much faster you could pay off this debt if you earned $100,000. We already know that our cost of living is $48,000 a year based on the above example. But now we are taking home $72,760 (that’s how much you’ll have on $100,000 after taxes). 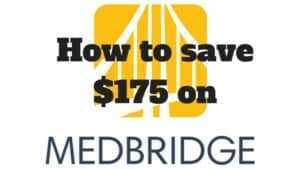 That means that instead of saving only $5000 a year, you are now saving $24,760. You could take that extra $24,000 and funnel that into your loans, or this could go to your retirement, amazing vacations, a house or anything else. If you had a $100,000 loan, this means that you would be able to pay off your loans 20% faster by earning $100,000 instead of $70,000. Thats huge! Step 3: Get that high paying career! Oh, and here are the top paying career options for PT’s. When I was in physical therapy school, there was really only one type of acceptable career route – a regular permanent position. In fact, I don’t really recall any discussions about contract work, tele health, per diem, and traveling. I’m here to be that teacher who should have told you about these paths. Why? Because these career routes are the ONLY routes that are really going to be able to help you pay off your loans! This is my favorite career route because this is how I really made a ton of money and created financial independence. But in addition to being paid roughly $104,000 a year pre tax, I also experienced a variety of settings and gained incredible skills that have really transformed the physical therapist I am today. 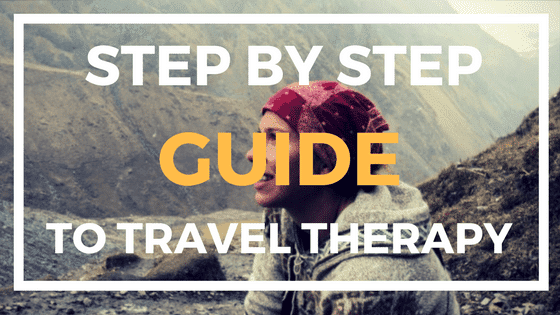 I feel that without traveling, I would never be as skilled or as confident of a therapist as I am now. This career option also allowed me to travel the nation as well as spend quality time at home while I did a travel position near my parents. Traveling is also incredibly flexible, allowing for young therapists to take vacations and or families to take time off for their children. 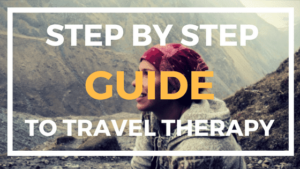 Traveling in my opinion is the best career route because, for physical therapists, you can earn more than any other position – if you are smart! You could earn between $88,400 to $104,000 potentially (pre tax). And this is totally possible as a new graduate. I actually feel that it is in my opinion the highest paying position for new grads. I was able to work non stop, secure reimbursement for my licenses and travel, and maximize my pay while enjoying my travel assignments. Not all travelers are this smart and as result, not all will have the incredible results that I have had. As a result of this, I have created a free mentorship program to help those who want to become travelers do so with success and conquer their loans in just several years! As a new graduate, before I discovered traveling, I was actually a contract therapist. This is very similar to traveling where you are working in a facility although you are hired by another company, but instead of 13 week travel assignments, you usually have an annual contract. I haven’t found clear average earnings for this route, but as a new graduate I earned roughly $85,000 a year pre tax as a contract therapist. I also did not negotiate this salary – totally a rookie move! I’m sure if you had more experience and better negotiation skills that you could earn more. In terms of a permanent position, home health is my number one choice. But be careful, many home health companies lure you into their position with high pay but in exchange, they may have impossible productivity demands and tons of paperwork. As a new grad, their may be little mentorship and you are all alone if a problem arises. But on the upside, you get to work one on one with patients. You get to drive around in your own peace and quiet instead of a noisy office, and if you want a permanent position to help you with your loans – then this is the go to one. Home health pay really varies as well. I have been offered $80,000 positions but this pay really will vary based on location, productivity demands, experience, negotiation skills and the facility’s demand for workers. Per diem work are as needed positions. You do the exact same PT work but just at location often separate from your full time work and it is often just when they require your help – say when some one is sick or on vacation or injured. Often you will work 1 weekend day a month, but for a high salary of between potentially $45 – 60 / hour. This one day can really boost your earnings and total salary. For example, if you didn’t want to choose the above career options, and you had a $70,000 position. If you earned $60/hr and worked 8 hrs once a month for the whole year, thats an extra $5,760 you earned. Now to really make money, try to work on the holidays. If you work on holidays, you’ll often get time and a half, so that $60/hr now becomes $90/hr! Now there are of course some more career routes, but the other routes come with a lot of investment in time and money (like a cash PT practice) or are not yet in high enough demand to consistently provide you a six figure income (like tele health). Also, I cannot guarantee what you will earn with any of these positions – the salaries I have provided are from my personal experience as well my peers. Ok, after you now have your awesome career that pays you hopefully $100,000 or more a year, you now want to look at your expenses. Even if you are making serious cash, if you are wasting that money on silly stuff – it’s not going to help you conquer your loans. Simply reducing your rent from $2000/month to $1000/month can save you $12,000 a year – that means on a $100,000 loan you could pay this loan off 12% faster simply by reducing your rent! Housing: High rent or mortgage payments are the NUMBER ONE thing I want you to really try to focus on and try to reduce. Why? It’s because this is something you will need FOREVER! This means that you are cutting this cost not just once, but forever and that savings is so much more than anything else you can do. Car: Car’s can cost easily over $20,000. That’s a lot of cash. In addition, think about maintenance and gas. All of this really adds up. In addition, like housing, you are relying on transportation for FOREVER. So reducing these costs are going to continue to save you money for a lifetime! Food: Food really isn’t as big ticket as transportation or housing, but I think you are seeing the common theme that you will need to eat every day for FOREVER. So creating better budgets or meal plans can save you $10-$100 a month over and over again. TV: Again this isn’t going to make a huge dent on your savings and how fast you conquer your loans. But it is another cost you can assess to try to minimize your spending. Many graduate student loans have an average interest rate of 7-9%. 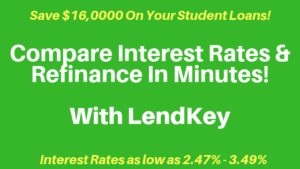 On a $100,000, if you were only paying the minimum payments to your loans, this means that you would be paying $7,000 – $9,000 just on interest EACH year! All that interest makes it really hard to pay off your loans and it also just makes it so much more expensive! Refinancing will reduce this interest rate, often from 7-9% to 2-3% and essentially save you potentially $5,000 to $7,000. Refinancing simply combines the loans you want to refinance (you can refinance as few or as many loans as you want) to a new loan at this lower interest. Make note that only private companies refinance loans, so if you do perform this action – you will loose your public loan benefits such as potential loan forgiveness programs. However, if you know you are going to pay off your loans then it benefits you to refinance vs staying as a public loan. There is so much more to refinancing and soon I’ll be coming out with a guide to refinance your loans. But if you think this is something for you, then I highly recommend Credible. They are a company that quickly compares top refinance companies and gives you all the different rates in just several seconds you could get from each company so that you can choose only the best rate for you. Credible also should have some more information on this topic in mean time to help you make your decision. Once you have picked the best company, I encourage you to go to my discounts page, as there are several refinance companies I have partnered with and I want you to get the $100-$200 bonus they offer when you sign up. This is an affiliate link but it is at no cost to you and for clicking the link, and you actually make more money than if you were to refinance directly from their site. Crazy I know! Step 6: Earn easy extra cash. Give yourself some wiggle room by doing these simple steps to earn extra $150 or more in just several steps! PT side hustles could be a whole article itself! But here are some of my favorite things that almost provide you an instant pay out! Robin Hood Free Investing Platform: I highly recommend that if you have any extra income, that you try to place a small portion in investments. I keep my investments simple and do index stocks as they pretty much are the average of the market, but you can research and see what you want to do. While banks will pay you little for your money, stocks have the potential for really amazing gains and with Robin Hood you can invest for FREE. If you click this link I get a free stock, but so do you! So you could simply not even invest anything and just get a free stock and watch that stock grow. The other thing that has enabled me to make a quick $1000 a year is opening new credit cards and getting their rewards. I know, I was skeptical about this route for years, but if you only open 1-2 cards a year and you make sure that you only spend enough to make the bonus and then you hide the card then you are essentially getting free money! I also don’t get credit cards that have huge spending requirements. For example, right now if you were to get the Chase Freedom Unlimited credit card, all you have to do is spend $500 in 3 months and you will get $150 back! After cell phone, tv, internet, and food, it’s super easy for you to meet $500 and get this free $150 (which you can get here). Don’t worry, if you only get 1-2 cards a year, this wont affect your credit. In fact, getting a couple more credit cards may actually improve your credit score as your credit score is partly made up of your credit to debit ratio. Now its your turn. I challenge you to think about what side hustles you can do to earn some easy extra cash! In just several years, I have been able to transform my life and it all started with the steps I have just detailed. 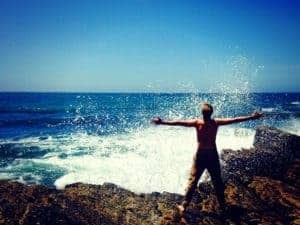 I have been able to go from have nothing in my bank account to feeling the start of financial independence. 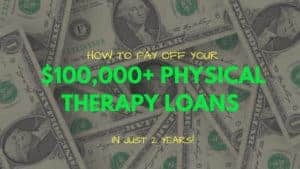 As a physical therapist, you can totally crush your student loans I hopefully have given you that confidence and hope that you can do this too! I’m a real person, so if you have specific questions about what you should do with your next career choice or how to earn more as a therapist, feel free to message me! In addition, check out my Debt Free Physical Therapy Facebook Group where I do a bunch of video trainings and comment directly to anyone’s questions.